The director/actor partnership of David Cronenberg and Viggo Mortensen (“A History of Violence” and “Eastern Promises”) continues with “A Dangerous Method”, which marks their third collaboration together. This time they’ve invited actors Michael Fassbender and Keira Knightly to the party as they delve into the repressed fears and desires of the early studies of psychoanalysis, primarily the relationship between Carl Jung and Sigmund Freud. It’s a genre departure for a filmmaker known for tapping into our fears of bodily infection and transformation (“The Fly” and “Existenz”), primarily in the sci-fi and horror genre. Those earlier films had a distinctive visual uneasiness that is absent here, understandable though considering the internal complexities of the mind that is obsessed over here. Set just before the first World War in 1902, the story finds a young Carl Jung (Michael Fassbender) treating patients at the Burgholzi Psychiatric Clinic in Zurich. He takes in a severely demented patient, Sabina Speilrein (Keira Knightley), a feral young woman who writhes about in her chair during their first session, trying to control her contorted physical spasms. Jung sits behind her, taking notes as he applies a new method, a “talking cure” form of therapy that his mentor Sigmund Freud (Viggo Mortensen) has developed. It’s a groundbreaking form of treatment amid the electroshock and surgical approaches practiced in the clinic. Through these challenging one-on-one talk sessions, a struggling (in every sense) Spielrein reveals that as a child she would become immensely aroused whenever her father would spank her (or, one assumes, beat her). This response has carried into adulthood, to the point of even just hearing a sound that is similar to physical force. Like when the two take a walk in the clinic’s picturesque garden and Spielrein becomes so aroused at the sound of Jung’s beating a dropped coat with a walking stick. It sounds silly (Mel Brooks or Blake Edwards would have a blast with such a scene – this is not that movie though), but when you watch it you wind up feeling embarrassed/sorry for her. With her sexual fantasies and past abuses exposed, Spielrein is able to gain control of her hysteric outbursts. She begins to build confidence in her own studies of psychoanalysis, which leads to her desire to share her observations with others in the field. During this time, Jung has written to Freud in Vienna, informing him of his patient, just as he starts to become tantalized by Spielrein’s insatiable descriptions and growing attraction to him. Through letters and eventual meetings, the two psychiatrists strengthen their Oedipal relationship, seeking and providing advice in their letters, and eventually even their patients. Freud sends Jung a troubled patient named Otto Gross (Vincent Cassel), a former therapist who turns out to be more than just a cad of a horndog. He spends his sessions reversing roles on Jung, schooling him in the ways of seducing patients and giving in to one’s desires. “Do not pass the oasis without stopping to drink”, is his last parting bit of wisdom before checking himself out of the clinic, far from rehabilitation. Gross clearly serves as a catalyst, or more accurately, that cartoon devil on Jung’s shoulder. Despite being married with children (or maybe because of), the restrained Jung succumbs to Speilrein’s alluring ways, which leads to – simmering (aka spanking) – doctor and patient encounters. Jung soon finds himself in a problematic triangle with Speilrein and Freud. Not the typical love triangle that one would assume (especially coming from a director like Cronenberg), but this is a struggle of conscience (Jung and Speilrein) and ideologies (Jung and Freud). The struggle we see between doctor and patient is less exciting than what we see going on in the conversations with doctor and doctor. Still, all three main actors will keep viewers transfixed, but it also helps to already be interested in the subject matter. By now, with 2011 being The Year of Fassbender, where we’ve witnessed one fine performance after another from him the actor, it comes as no surprise to find more absorbing work in his Jung. He plays the tortured doctor quite well, holding in varying conflicts within his expressive chiseled features. As one would expect, Mortensen is great as the contemplative Freud, providing both subtle comic relief and stimulating rivalry. But if it wasn’t for the completely mesmerizing acting from Knightley, the film and its Talking Head material, would be quite a bore. Hers is the character with the most obvious arc to it, requiring the actress to bring a wide range of skill to the role, which she does in an impressive manner right from the start. It’s a reminder that she’s more than just the bodice-wearing, sword-swinging actress she’s known for. From the film’s synopsis, it would seem that this is predominately Jung’s story, but it becomes clear from the start that it is as much Speilrein’s, with the shadow of Freud looming. Instead of giving us an exhaustive history of psychoanalytics, screenwriter Christopher Hampton thankfully gives us a concise and focused period in the lives of these three people. Based on Hampton’s 2002 stage play, The Talking Cure, which was inspired by a 1993 non-fiction book, A Most Dangerous Method, by John Kerr, the screenplay is full of posed questions and theories revolving around repressed sexuality, whether or not spirituality has a place in psychoanalysis, and the moral dynamic of patient and doctor. Those seeking out the film for Cronenberg, may be somewhat disappointed as this is a departure from what we’ve come to expect from him, but that’s what I appreciated about it. At this point in his career, it’s nice to see him try out a different genre, while still delving into the turmoil of relationships he’s known for. Cronenberg has included certain quirks and complexities, yet his style here is quite straightforward, bordering on bland. One has to wonder just how exciting and grasping such a picture can be considering the subject matter. 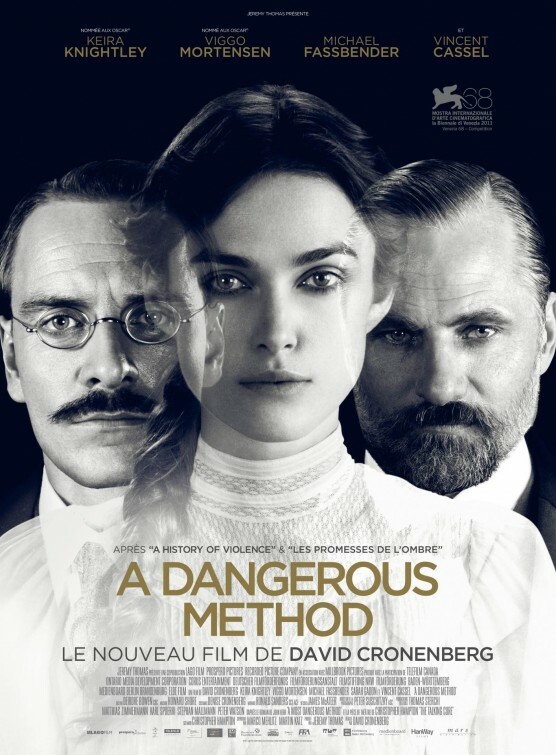 The cast and the material may make “A Dangerous Method” more interesting than it is absorbing, but like therapy, it all depends on what you want to get out of it. Really, really looking forward to this one.